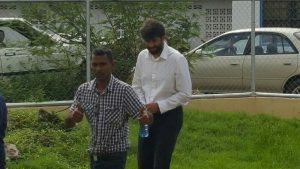 A Guyana Revenue Authority Drug Enforcement Unit agent and two motor racers are among four persons refused bail on a joint charge of trafficking in 84.9 kilogrammes of cocaine. The Drug Enforcement Unit agent is Sherwayne De Abreu. The others are racers Stephen Vieria and Nazim Gafoor as well as his father, Tazim Gafoor. 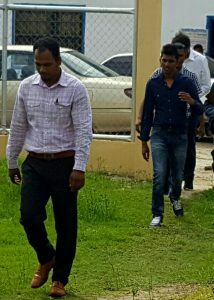 Tazim Gafoor (left) and Stephen Vieria being escorted to the Leonora Magistrates’ Court by CANU agents. They all pleaded not guilty to the offence of trafficking in narcotics between March 1, 2017 and May 12, 2017 at Narine Lall Sawmill, Lookout. Lall was not in court and an arrest warrant was issued. They were refused bail at the Leonora Magistrates’ Court by Magistrate Roshelle Liverpool and ordered to return to court on June 12 for disclosure of statements and fixture of trial date. They were refused bail, despite stirring applications by a battery of lawyers made up of Everton Singh-Lammy in association with Glenn Hanoman, Latchmie Rahamat, Stanley Moore and Mark Conway. Under tight security by several agents of the Customs Anti-Narcotics Unit (CANU), who were armed with assault rifles and protected by helmets and bullet-proof vests, the CANU prosecutor, Konyo Sandiford told the court that the joint charge was laid after “three months of surveillance” of Vieria that led to him and the other persons named being charged. She opposed bail based on the seriousness of the offence and the possibility of they not returning for court hearings because they may be jailed. Responding to Defence Lawyer Moore’s bail application based on Nazim Gafoor’s epileptic medical condition, the prosecutor noted that the 20-year old man was being treated with Dylantin and was told to wear a neck brace both of which can be provided while he is on remand. A medical certificate obtained from the St Joseph’s Mercy Hospital was presented to the court by Moore. He added that there was no evidence that his client was in possession, counselled, aided or abetted anyone. Rahamat told the court that Vieria, 33, is a professional racer with an unblemished record. She stressed that her client was never found in possession of any narcotic. She added that the narcotic was found at a place over the river. CANU has said the cocaine was found in a consignmeng of dressed lumber at Zeelugt, East Bank Essequibo. Rahamat told the court that although Vieria’s signature was on shipping documents, it was for a shipment of wood that had been already at the GNIC wharf and no narcotic was found in that consignment. “There is absolutely no indication that Stephen Vieria had any knowledge of the narcotic,” Rahamat said, adding that the prosecution’s case lacked the elements of possession-care, control and knowledge. CANU has said the cocaine waa bound for the United States where it would hace fetched a street value of more than GYD $500 million. The lawyers told the court that their clients had been cooperating with investigators at all times.